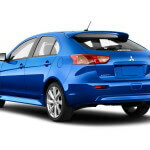 The 2014 Lancer Sportback is a five-seat sporty hatchback, a version of the popular Mitsubishi Lancer compact sedan. 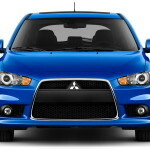 The Lancer Sportback is almost identical with the Lancer sedan, but has a smaller cargo space and it looks more dynamic thanks to its spoiler-topped tail. 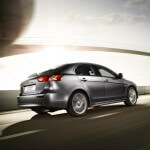 The 2014 Mitsubishi Lancer Sportback competes with the Mazda3, Ford Focus, Subaru Impreza and Kia Forte. 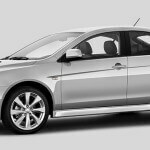 The Lancer Sportback has a muscular exterior styling and a clean interior, with comfortable seats and simple instrumentation. Rear-seat space is adequate, relative to other cars of this size. The cargo space is decent for its class, at 52.7 cubic feet with the rear seats down. 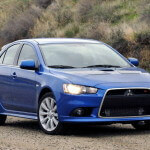 The 2014 Mitsubishi Lancer Sportback is offered in two trim levels: ES and GT. The Sportback base ES model comes standard with 16-inch steel wheels, air-conditioning, a rear spoiler, automatic headlights, a height-adjustable driver seat, a trip computer, full power accessories and an 140-watt four-speaker audio system with a CD player. The Deluxe package is available for the ES and adds keyless ignition, keyless entry, a power glass sunroof, leather-wrapped steering wheel, a color multi-infornation display, Bluetooth connectivity, a 6-speaker sound system and 16-inch alloy wheels. 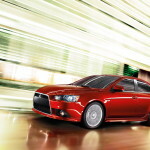 The Lancer Sportback GT comes with the contents of the Deluxe package as standard and adds a sport-tuned suspension, automatic climate control, foglights, a rearview camera, a 6.1-inch touchscreen and 18-inch alloy wheels. A sunroof, heated front seats, automatic bi-xenon headlights, rain-sensing wipers, leather upholstery, an auto-dimming rearview mirror and a 9-speaker 710-watt Rockford Fosgate premium sound system are also available as options grouped in the Touring package. Also available is a navigation system with a 7-inch touchscreen. 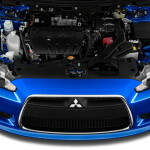 The 2014 Mitsubishi Lancer Sportback ES is powered by a 2.0-liter four-cylinder MIVEC engine that produces 148 hp and 145 lb-ft of torque. The Sportback GT has under the hood a 2.4-liter four-cylinder engine that produces 168 hp and 167 lb-ft of torque. 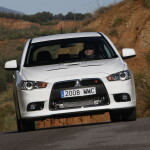 Front-wheel drive is standard for both models. Both engines are paired with a CVT transmission with shift paddles. 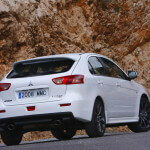 Check our image gallery for 2014 Mitsubishi Lancer Sportback pictures. 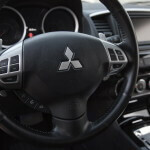 Posted on March 4, 2014, in 2014 Car Models, Mitsubishi. Bookmark the permalink. Leave a Comment.